All hail the queens!!! Everybody's Mara Clara feels were unearthed a few Sundays back as they had a big reveal of Kathryn as AirOptix's first ever Filipina endorser!!! She now joins Julia Montes as one of Alcon's muses (and I guess this is also saying that Alcon is continuing its relationship with Julia Montes as Freshlook's endorser, so yaaaay!). Alcon is probably a name you've never heard of, but in actuality, probably most of the eye drops and solutions you've used are from Alcon. Alcon is the world leader in eye care and eye medical instruments, so yeah, there's that. 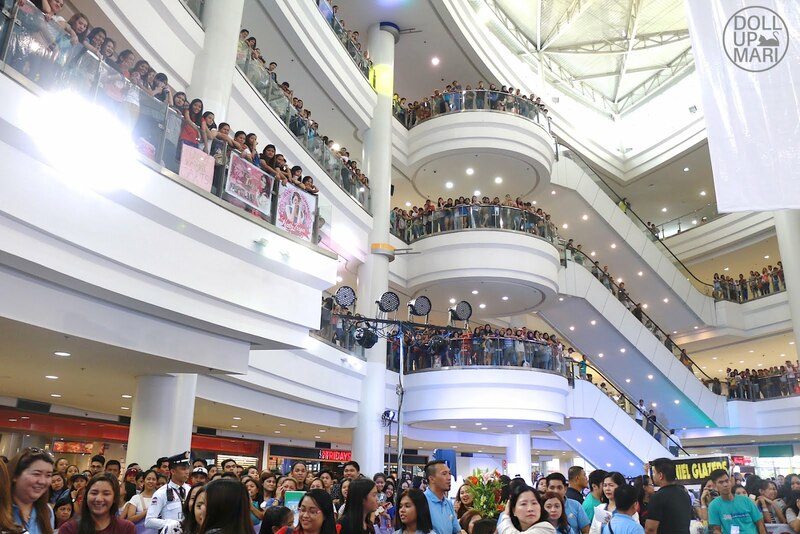 This event was held in Robinsons Place Ermita, and the crowd was wiiiiiiiild!!! Sooooo wiiiillddd!!! I was told that some fans were already waiting for the event since 8AM even if it was advertised that doors open at 10AM and event starts at 2PM. Such devotion!!! They have soooo many fans clubs and so many different chapters for each! I saw so many kinds of streamers that day. The UP streetdance crew kicks off the program. Fans were screaming and hysterical about everything, including this dance number. I understand them because I was screaming, too, but deep inside hahahaha. Senior officials of Alcon Philippines welcome everyone and talk about how happy they are about the event. They also took the time to correct a lot of mistakes people make with contact lenses and they also debunked a lot of contact lens myths. 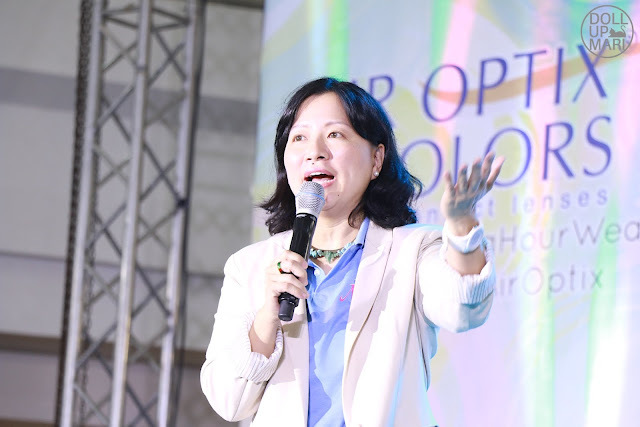 This is their head optometrist, Dra. Cirila. She took everyone's attention to the screen so that they could see the educational video Julia and Kath have prepared for their fans. Check out their educational video here! Everyone was so excited to see them I'm not exactly sure how much retention had from the pearls of wisdom from this video so here it is again. 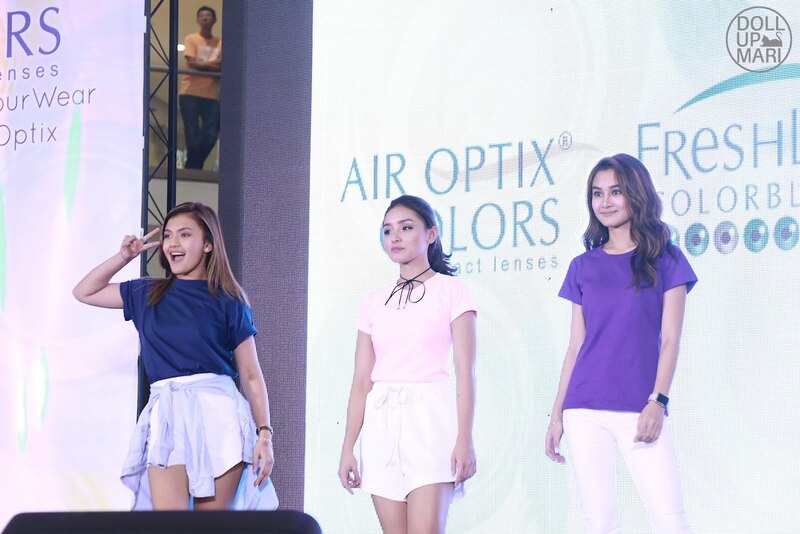 They also featured a Star Magic celebrity contact lens fashion show! In purple is Chienna Filomeno. Karen Reyes was also present in the event and was all smiles the whole afternoon. She's sooo pretty in real life!!! She looks so fresh and errthing. Sarah Carlos was also present that day! And finally, after a tense dance number (tense because everyone knew that this is THE entrance dance number), the queens make their entrance!!! They were greeted by a strong and cheering Robinsons Ermita crowd. I feel like even the people who didn't know of the event joined in the screaming as well because they really are that pretty and stunning and lovable and adorable and everything (yes I admit I'm a fan, too, especially of Julia). The moment Julia sat down she kept on reiterating how thankful she was of everyone who spent their time with the two of them on a Sunday. She was all smiles and was waving often to crowds watching from upper floors. For today Kathryn took the chance to thank all her fans, and to thank Alcon for making her part of their family as well. The two of them expressed how happy they are to be back together for work, because the last time they were together was more or less a little bit after Mara Clara. Kathryn went on to build a strong love team with Daniel Padilla while Julia went on to become a bankable heavy drama actress, so it's quite apparent their careers took different directions. They are so happy to be back together. Kathryn personally likes to use the Pure Hazel ones from AirOptix because they are natural looking and are very comfortable. She explained that having to do work assignments that span for many hours calls for contact lenses that are breathable and comfortable. She also explained that her work also requires her to change up her look so often that many times, merely changing hairstyles, clothes, and makeup isn't enough. There really is some sort of magic that only contact lenses can provide. Julia on the other hand admitted that she really can't live without contact lenses as she has a 3.00-4.50 grade, one having a different grade compared to the other. She really needs a lot of Alcon's products. She agreed with Kathryn that it really takes a good pair of colored contacts to change up one's look, especially if it's needed for a particular role or occasion. 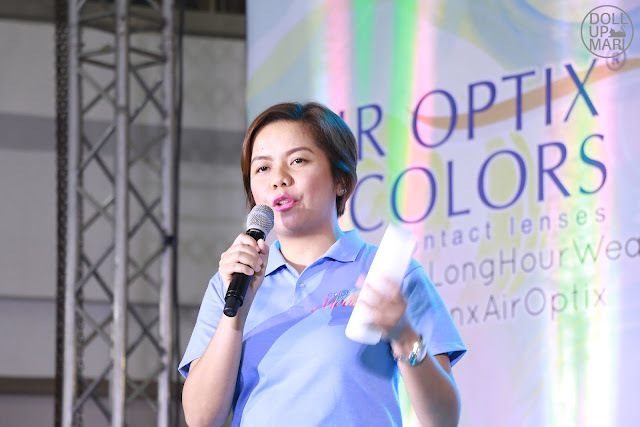 Aside from the colored offerings, she shared how much she loves AirOptix's day and night contact lenses as her schedule is erratic all the time. Being a celebrity means working many hours straight and only getting random glimpses of sleep, so for her, being able to have contact lenses that she will not worry falling asleep in works to her advantage. I love Julia's lipstick for this event!!! Like if I'm not being mesmerized by her presence or her eyes, I'm being mesmerized by her eyes. After the event, the two happily posed for photos, entertained interviews, and greeted their fans! So many people went to see them, and it's amusing how they are still amused when people revere them, even after all these years of being powerhouse celebrities. I actually just bought four pairs of Freshlook today (aside from the ones given to us by the brand), so let's see if I get even 3% of Julia's beauty anytime soon!